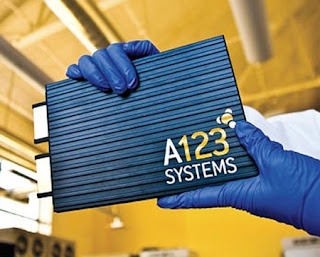 Not so long ago, I was long A123 Systems. But over the course of 3 years, I went from long to wrong. I was enthusiastic about the company's products, its lineup of investors (GE, Qualcomm, Sequoia Capital), and its partnerships with leading electric vehicle manufacturers, such as Fisker. And, back on October 2, 2009, when $AONE stock hit its all-time high of $25.77, I along with others felt pretty good about it. Yesterday, A123 joined an illustrious list of US government-backed companies seeking bankruptcy protection, a list that includes Abound Solar, Ener1, Beacon Power, Open Range Communications, and Solyndra. Not very good company, I'm afraid. It all comes down to price. The cost of producing A123's batteries didn't come down fast enough so that, it "cost them more to make them than the could sell them," according to an industry analyst quoted by Bloomberg this morning. "The more they sold the more they lost." Coupled with the still too-high costs of electric vehicles and consumer "range anxiety" and you have a volatile mix of factors that led to the company's failure. But that's not all. The company had been plagued by contract and warranty issues over the last couple of years, competition from Asian giants like Panasonic, LG, and others, along with increasing potential safety concerns. In August, a Fisker Karma caught on fire in Woodside, CA. The fire was apparently unrelated to the car's A123 battery pack, but it nevertheless fueled concerns about Lithium-ion battery safety. A earlier recall of Karmas for a battery coolant leakage issue didn't help matters. Even a Chinese lifeline couldn't save the beleaguered company, as "unanticipated and significant challenges to its completion" scotched a deal with Chinese automaker Wanxiang. Now Johnson Controls (another company whose stock I once held) has agreed to purchase A123's automotive business assets for $125 million and the rest of the company may be sold at auction on November 19th. Consolidation happens. Companies fail. A123's bankruptcy is just another example of a bet gone bad. For every cleantech failure, however, it gets tougher and tougher to recharge investor and consumer confidence. Our Climate War: FRONTLINE's "Climate of Doubt"